According to a short press release, Jeff Hawkins, founder of Palm, Inc., will in a few hours later today (Wed, May 30) host a live video webcast to describe a new category of mobile device called the Palm Foleo which works as a “companion” with Palm’s Treo smartphones (Palm OS and Windows Mobile versions). The webcast will follow the announcement of this new product at the D: All Things Digital conference in Carlsbad, California. At 11:30 a.m. Pacific time, Hawkins will discuss Palm's vision for this new category and demonstrate the new product's capabilities, followed by a Q&A session. UPDATE 2: I have to admit that I been quite shocked by Palm’s release of the Foleo yesterday – a product whose target audience and ultimate “purpose” I currently completely fail to understand and which has left me and most Treonauts totally underwhelmed. UPDATE: First Foleo Images Now Available! Palm today announced the Palm Foleo – the world’s first smartphone companion product. Foleo has a large screen and full size keyboard to view and edit email and office documents. Edits made on Foleo automatically are reflected on its paired smartphone and vice versa. Foleo turns on and off instantly, features fast navigation, a compact and elegant design and a battery that lasts up to five hours of use. US availability for Foleo begins this summer with pricing expected to be $499 after an introductory $100 rebate [making it either one of the most expensive “Treo accessories” or one of the smallest, lightest and cheapest portable computers…]. Built on an open Linux-based platform, Palm hopes to replicate earlier success with developers by drawing a large community to create new applications that will extend the mobile companion’s capabilities. Already, Palm has partnered with DataViz and Opera Software, demonstrating the ease with which applications can be ported to the Palm Foleo. Avid readers of the Treonauts blog will note that the Foleo device concept closely resembles a vision that I first outlined nearly three years ago in August 2004 with a post entitled Treo PC & TV: The Race is On in which I argued that our Treo would in the future be combined with a full-size monitor and keyboard to more effectively replace the need for a PC. Two other posts in September 2005 – The Evolution of the Smartphone and Smartphone as a Computer – further showed how our Treo could eventually become the ideal “non-PC-centric solution”. This is awsome! I'm getting one!! This simply can't be what they consider inovative. It's a friggin eMate from the early 90s. Or maybe a Psion. 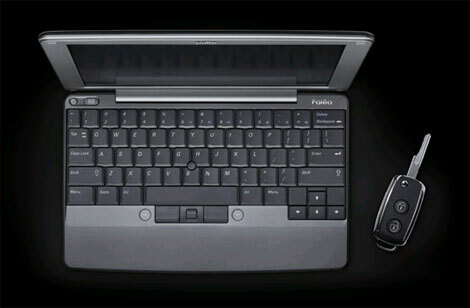 Of all the Palm or Treo users I know, only 1 owns a foldout keyboard. One. I'm sure he can't wait for this. But just him. What a letdown! I am sure it's a fabulous device but it won't meet all my needs. I was hoping for a Treo-like device but a bit further along the evolutionary ladder i.e. with a slightly larger screen, wifi and more evolved functions etc. But no - we get this thing, which will be completely useless - I won't be wanting one cos I don't like carrying more than one device around with me! When are Palm going to bring out a Treo running on a Palm OS with Wifi and 3G? What a bust - Palm have been imploding for the last couple of years (especially with the Windows CE devices) and this is the final nail in the coffin. HAHAHAHAHA! What a waste of time and R&D efforts! As someone else posted on another forum, Palm just answered a question that no one asked! OOPS! In a world where everyone is trying to carry LESS, here goes Palm trying to tell us that we should be carrying MORE! What a joke! The $100 OLPC (One Laptop Per Child) is a much more compelling offering at a fraction of the price. Correction: This is not just pathetic, it's also stupid. the old toshiba satalite was smaller and on a standard windows platform back in 1998. palm looks like a short to me. They say they are not for sale. What better way to prevent the sale of palm but to create an expensive box that nobody will buy. Its the ultimate poison pill. This device is just announced and already looks like a dud. I've been a Palm/Treo user and fan for years, but I fear the world is passing us by and will quickly obsolete our Treos. I sure won't buy the Foleo! I see a lot of potential for this device, at least for my needs. More and more my Treo is my primary computer but it isn't great for writing, which is something I need to do often, and in various locations. For some years I used a folding keyboard and Wordsmith with a Tungsten (and before that a Zire) and that worked great for me. Now, I either carry my laptop (ugg..) or a very old Alphasmart which still works great, but I'd rather have a single solution, and Palm syncs easier. 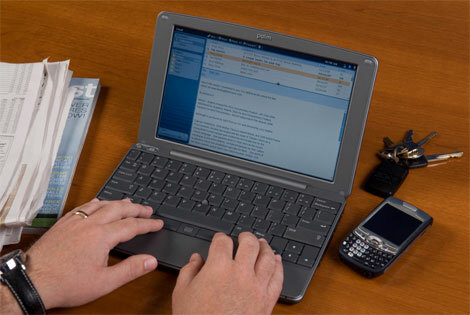 The Alphasmart needs to emulate a keyboard and write your file into a document through a USB cable. The full powers of my Treo and more in a device about the size and weight of my old leather padfolio with a pad and pens would be great. I'll consider it once the reviews start to come in. Thank you Palm. Introducing the Flopio and arguing that it makes more sense to carry along this monster plus a smartphone instead of simply a Nokia E90 (which does a lot more in one device!). Ridiculous. Andrew, can you please start Nokianauts soon? Btw, what a great name for a Product. Of course, Flopeo / Flopio will be the most accurate reading, but Fooleo makes also a lot of sense. How about Forgetteo? Lowleo? Noleo? And finally: No-Treo. Appears that Jeff Hawkins sold 15,000 of his shares in Palm today. YAWN! How about a better Treo instead?! Hunh? Wha? I thought electronics companies were done throwing money into the between-a-PDA-and-a-laptop range? It's a nothing. I know that commercial has the business professional go on his entire trip with nothing but a Treo, goes to the meeting, Bluetooth links to the projector, makes his presentation, goes home. His Treo does everything. Great. Now what about the other 99.9% of us who use our Treos for, you know, practical applications? Keep our checkbook registry on there? Read books? Use real estate/medical/whatever industry specific software there is? Just use it because we're dorks and it's cool to us? A good replacement for a fold out keyboard if they cut the price to match. So Palm, sell it for $100 bucks and maybe someone will buy it. Poor Palm. They are going to get annihilated when the iPhone comes out. I actually have to use a laptop when I travel for work because my office applications are unlikely to run on some random variant of Linux. Is this really that much smaller and lighter than a Thinkpad X60? It is hard to love someone who doesn't want to be loved. I just don't get it. No WiFi? No Hard Drive? It's just a larger screen and keyboard!?! All that for more that the price of the Treo itself. I must me missing something here. Too bad they didn't put a Lifedrive inside there. 1. I, and all the other mobile executives in my company have been using 10 1/2 inch screened Fujitsu P-series sub-notes for years. We need basic laptop functionality but hated lugging around our 14 or 15 inch Dell and IBM units. Anyone constantly rushing between airport terminals, rental counters and parking garages would understand. Not including broadband data cards, we spend $2100+ for each unit(they're less than Sony Vaios; but, there are NO cheap business sub-notes.) A $500 substitute could be interesting. It cost about $350 to replace a drive the last time one of our laptops fell. 2. In addition to its solid-state storage, the Foleo accepts compact-flash cards for use as a primary storage "drive." Compact flash is fast, energy efficient, and ridiculously rugged. Samsung announced 32 and 64 gig card technology last September...Hmmmn, interchangeable work and play drives. And the Foleo has an sd-card slot too. Very interesting. 3. It multi-tasks, has built-in Wifi, Bluetooth 2.0 and available hard drive like capacity without the mobile hard drive pitfalls. It's slimmer, lighter and waaaay cheaper than my sub-notebook which I love. Lug around a cheap 14"/15" brick all day and you will know why our group and others only use the more expensive smaller laptops. 4. It runs Linux. There are already cheap or free Linux apps for (VNC, VPN, Terminal Services, Citrix, IM, office docs, email, multi-media, MS Windows networking and more for) everything I need for work and play. Give developers a little time and the device a little better processor, and I wouldn't need anything else. I haven't had Microsoft's office apps on my laptop for at least two years. What's the point? It would not replace our Treos or XV-6700's. It would not be on me all the time. But there is a business segment that could use this - IF it could replace a laptop when needing laptop utility. 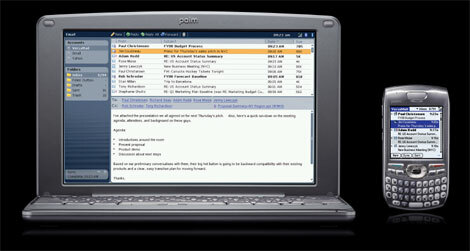 Palm is marketing it as an email and web client. At $500, that is not enough use. Offer a $500 mobile computing platform for my business - let's talk. Heck, I'd get one for every one of my building managers. At that size and weight, offer the case in different colors, include Open Office and full multimedia for $399, and it would be a Home Run with students. It's 2007, multi-media is a must. In my personal experience, almost every teen to college-age person who sees one of our little P-Series laptops think they're the coolest. Girls especially think they're cute. Palm, you almost have the right product. But, you're definitely "selling" the wrong concept to the wrong people. 1PhillipT, you bring up some good points that show some benefit to the Folieo. Also after going back and doing some more reading it appears it does have WiFi which also has some redeeming value.